This is probably a refrain that many of us heard in our youth. Replace “nice” with “good,” “sweet,” “cute,” or “charming” and there are any number of variations to communicate this praise for young women that reinforce the idea that we should be agreeable, nonthreatening, and, most importantly, likeable. While there is nothing inherently wrong with any of these traits, the challenge arises when they become the primary character themes of our youth and ones that are reinforced through adulthood and into our professional lives as female leaders. Because, let’s be honest, people of all genders prefer women who are likeable, non-threatening, sweet, and nice. Popular media and academic scholarship show that “high-achieving women experience social backlash because their very success – and specifically the behaviors that created that success – violates our expectations about how women are supposed to behave. Women are expected to be nice, warm, friendly, and nurturing. Thus, if a woman acts assertively or competitively, if she pushes her team to perform, if she exhibits decisive and forceful leadership, she is deviating from the social script that dictates how she “should” behave. By violating beliefs about what women are like, successful women elicit pushback from others for being insufficiently feminine and too masculine” (Cooper, 2013). Variation from the theme of “nice” and “likeable” in women is often met with harsh criticism and much less positive vernacular: bossy, stubborn, manipulative, pushy, etc. Even the value-neutral word “ambition” often takes on a different tone when it is applied to women than it is to men and is highly correlated with their likeability. For men, it is an expected and praised trait. However, for women it is typically considered too assertive, unbecoming, and even embarrassing. Thus, it seems that women in leadership positions are especially doomed to the Faustian fate of finding success or being liked. Herein lies the challenge for many leaders and particularly for female leaders. Despite the fact that we have been told our whole lives that being likeable is the ideal, to effectively lead, one cannot be beholden to the ideal of being liked. In most organizations, especially the more complex ones, consensus is nearly impossible and someone is likely to be unhappy with the leader’s decision–even if it is the best decision. Further, the notion of “likeability” is subjective and individualized and, therefore, can undermine other principles that are often critical to an organization’s collective operations and success such as equity, accountability, and authenticity. 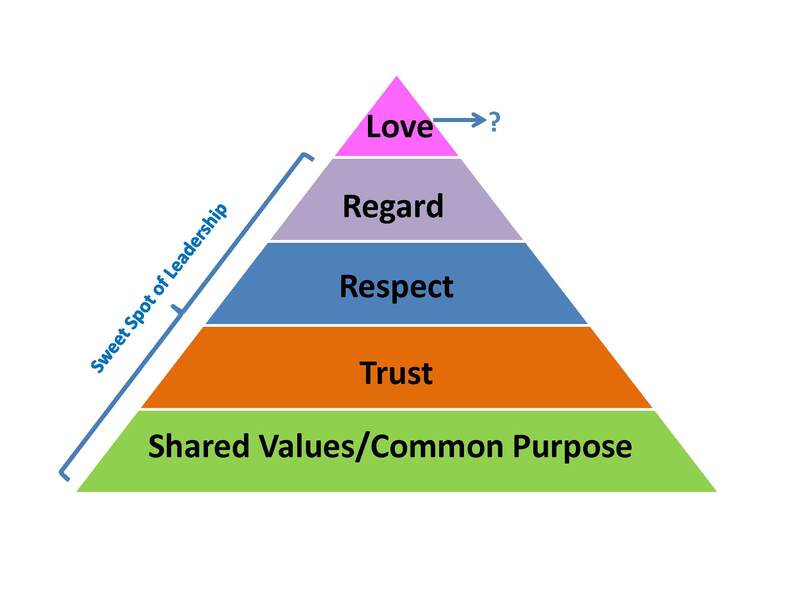 Other values, such as common purpose, trust, and respect are essential to good leadership and an effective organization. I would even argue that striving for regard or esteem is a reasonable substitute for wanting to be liked (I have successfully worked with and for people whom I have regard but haven’t particularly liked) and ideals that may even add to the collection of variables in the leadership equation: shared purpose + trust + respect + regard/esteem = the leadership “sweet spot.” Yet, too often, female professionals chase the elusive notion of being liked as leaders, hold it as the pinnacle of their leadership value pyramid, and, ironically, end up miserable. Don’t Sacrifice Who You Are: The best way to alleviate your need for “love” and validation in the workplace is to find it in other, much more appropriate places. Female professionals often sacrifice their own needs, including other relationships, in pursuit of career goals and yet those other relationships and the positive reinforcement and support they provide become even more important as we rise up the ranks. Recognize the Difference between Individual & Collective Goals: Remember that leadership is a balance between individual and collective interests with the scales more often tipping toward the latter. Likeability is typically about individual relationships but your responsibilities and obligations as a leader are often to the organization, which represents the aggregate of all the colleagues therein. When viewed in this framework, likeability becomes an unimportant goal (although an enjoyable byproduct) in the workplace, regardless of your gender. Look Outside for Love: It is possible to “feed the need” for love in the workplace through avenues outside of your immediate environment. I have purposefully nurtured mentors, professional friendships, and networks (including the Women’s Leadership Book Club I joined) with other people who are not from my organization or my institution. In those relationships I am able to avoid confounding the issues of support and likeability with organizational priorities and goals. Do Something EVERYDAY that Brings You Joy: Buy great shoes, meditate, exercise, spend 10 minutes connecting with colleagues on social media. Do something that brings happiness into your life. In my experience, these things can be balm for the soul even on days when I have to make difficult professional choices that are not liked. At the end of the day, which would you rather people say about you: “She was a strong, respected, and competent leader” or “She didn’t get much done, but people really liked her”? Which statement motivates you to strive for excellence in your role? Which statement will land you that next job? Which statement is truest to your values? Thanks for your comments! We appreciate it! If you’re interested in contributing a post or two, please complete the “Add your Voice” form! Fantastic post! Keep up the good work.